Post-Braces Care: Wear your retainer! Many patients underestimate the importance of wearing their retainers after their braces come off, but it is one of the most critical post care practices to keep your teeth in alignment. Why spend all that time, energy, and money to straighten your teeth when you don't plan to keep them straightened after treatment? 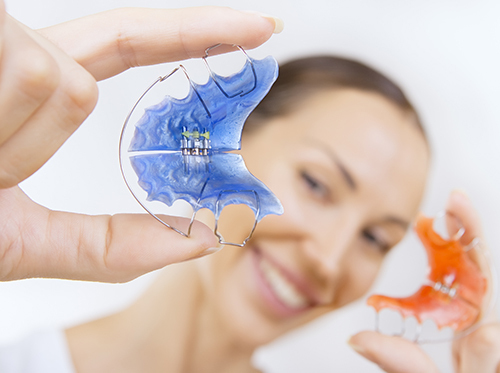 As the name implies, a retainer keeps teeth from moving back to the positions in which they started before treatment was administered; they "retain" your smile and bite. There are many different types of retainers—some are removable and some are permanent. Some retainers are made of plastic and metal (known as Hawley retainers) and others are all plastic or all metal. Some retainers can even be bonded to the back of your teeth! How long do I need to wear it? If you've been given a removable retainer by Dr. Nathan Downey, you may be wondering how long you need to wear it. It takes time for the tissues and bones around your teeth to reorganize and set into place after braces treatment. The amount of time you’ll need to wear your retainer depends on your unique situation, but typically, retainers should be worn at least as long as the time you spent in braces. You might need to wear them full-time for a while, and then transition to wearing them only at night. Dr. Nathan Downey will have a treatment plan especially for you, and if you stick to it, you'll always have a straight smile. Research has shown that there is no “permanent” position for your teeth to remain in. In fact, some studies say upward of 70% of patients will see a change to their bite and tooth alignment as they get older. This applies to people who have had orthodontic treatment and those who have not. Of course, some people's teeth never seem to shift—you can consider them the lucky ones, as most people's teeth do. And this is precisely where retainers come in. The only way to ensure your teeth stay in alignment long-term is by wearing your retainers. If you have any questions about retainers or your treatment plan, please ask any member of our Bowling Green, OH staff.